Lego fans, the National Gallery of Victoria needs your bricks! A car with an open sunroof in Melbourne’s national gallery has become the world’s first collection point for Lego bricks to help an international artist create his latest project. 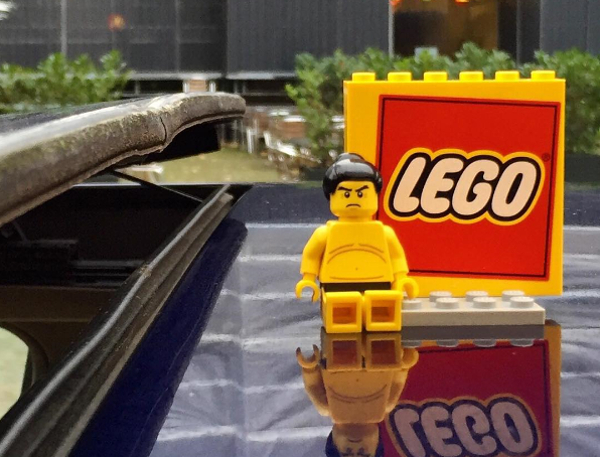 When Lego refused to fill Beijing artist Ai Weiwei’s bulk order of coloured bricks for a new installation because of the artwork’s “political agenda”, he took matters into his own hands. The BMW, in the National Gallery of Victoria’s sculpture garden, is the first international Lego collection point for Weiwei outside of Beijing and one of several in cities around the world. The artist’s initial request for Lego was for the gallery’s upcoming exhibition, Andy Warhol – Ai Weiwei, to open in December. The artist was going to build mosaic portraits of 20 Australian human-rights activists, including Geoffrey Robertson QC and Wikileaks founder Julian Assange. Since Lego’s refusal, the artist has decided to make a new work to defend freedom of speech and political art. People have already donated their Lego by dropping the bricks through the sunroof of the car. NGV director Tony Ellwood tells Broadsheet the gallery has received many offers of donations of Lego. “People have shown their generosity, creative spirit and enthusiasm to become engaged in this project, and we are pleased to be the first international collection point,” he says. Donations of Lego can be made at NGV International, St Kilda Rd, 9am-5pm daily. People who live outside Melbourne can post their Lego bricks to NGV, 180 St Kilda Rd, Melbourne, Victoria, 3004. 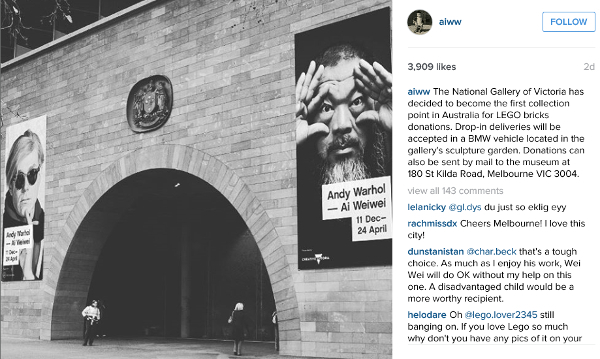 Andy Warhol – Ai Weiwei will show at NGV from December 11 to April 24, 2016.